Jesse Galganov ’17 had planned to backpack throughout South American and Southeast Asia for eight months starting on Sept. 24. As of publication, his whereabouts are unknown. He has not been heard from by his friends and family for over a month. Galganov left for the hiking trip and spent the first few days in Lima, Peru. His subsequent plans were for a four-day hike through Huascarán National Park. He texted his mother, Alisa Clamen, on Sept. 28 that he would be out of contact until Oct. 2 while he was hiking. Galganov has been unreachable since. Despite multiple searches by authorities in Peru, no trace of Galganov or indication of his whereabouts have yet been identified. Clamen noted to the Toronto Sun that the lack of evidence indicates that Glaganov may have been kidnapped. Clamen explained that after not having heard from her son for more than a week she realized something must have been wrong, and filed a missing persons report on Oct. 14. She flew to Peru on Oct. 17 in order to assist in the search. Galganov’s father, Todd Galganov, has also flown to Peru. Clamen notes that she has printed over 500 posters of her son, distributing them in the area from which he was last heard. 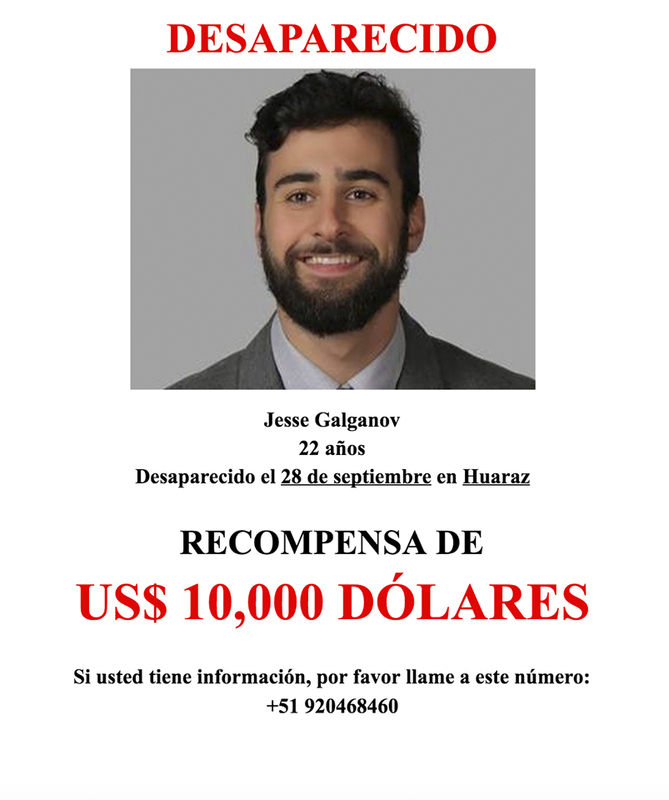 Information about the effort to find Galganov has swept across Peru, Canada, and America via social media platforms such as Twitter and Facebook and through a GoFundMe page and a Change.Org petition. In addition to family and friends, current and former University students are promoting awareness of Galganov’s disappearance and have been donating to the GoFundMe page to raise money for the various high-cost campaigns to track him down. The GoFundMe page raised more than $118,000 in ten days, with over 1,000 separate donations in that time period. Many current and former University students posted links to this page over the course of the past couple weeks. The money will be used for various expenses associated with the search. In addition, the Facebook page “Help us find Jesse” has been instrumental in the distribution of up-to-date and accurate information about the situation. A recent post on Oct. 29, for example, highlights misinformation about the location at which Galganov was last seen. The post invites readers to reach out for accurate information. Many University students both follow this page and have been posting links to its posts on Facebook. In addition to the Facebook page and the GoFundMe page, efforts to support the search for Galganov have recently come into play via a Change.org petition that requests Apple, T-Mobile, and Amazon to reveal information about Galganov’s use of electronic devices while in Peru. The petition garnered more than 62,000 signatures in five days, demonstrating the speed with which information about Galganov has spread. Along with many friends and family of Galganov, individuals with more social media clout, such as comedian and actor Julia Louis-Dreyfus, and former child actress Lindsay Lohan have been tweeting about his disappearance. On Oct. 25, a post to the petition site explained that the many signatures led to the successful response from all three companies. In a recent update poster to her Facebook page, Clamen explained that efforts to obtain more information from the local phone carrier in Peru continue. “We finally received access to Jesse’s Apple ID, which was provided directly to me by Apple’s Global Legal Enforcement department two weeks after it was requested. In turn, we provided the Peruvian Police with his relevant time and geolocation information as they had not received comparable information from Apple. We still have not received information from the local carrier that was court-ordered. T-Mobile continues to work with us to pressure the local carrier to release this vital information,” the update read. Search and rescue teams are continuing to search the areas in which Galganov planned to hike, and Clamen and others are working to engage additional private teams to assist in the search. University President Michael Roth ’78 sent out an all-campus email about Galganov on Oct. 30. Likewise, Emma Gilberg ’16, who was close to Galganov and has been heavily involved in efforts to find him, noted the value of University student involvement in an email to The Argus.